Inspired by her volunteer assignment in Kumbo Cameroon, Pat Moore put her creative energy to work, writing Clean Water for Lukong, the story of a day in the life of a little boy named Lukong. 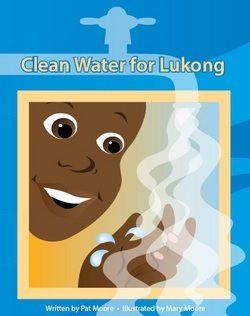 Lukong is learning about the importance of clean water, and how proud he feels to play a role in the family by helping get the water from the public stand tap, keeping it clean, and helping with related tasks. Beautifully illustrated by Mary Moore, this book serves both for literacy, and to teach about clean water. It is a beautiful book for young readers, and informs western kids about a day in the life of another culture. Check out the Book Launch dates and locations. Proceeds from the book go to water and literacy projects. Download the song for free. For teachers and community leaders in Africa...download file. To hear the song, click below!